Whether a success or failure, it’s very clear that Netflix is a creative hub for original ideas. Ranging from the very popular series Stranger Things to the debatably successful film Bright, uniqueness is something that the streaming site prides itself on with its projects. It can also be argued that steaming sites like Netflix are very quickly replacing traditional television, and it seems that Simpsons and Futurama creator Matt Groening wants a slice of the internet cake. And thus his latest project, Disenchantment, was born. But how does it hold up? Eh, it’s alright. It’s probably Matt Groening’s least enjoyable animation, but as an animation by itself, it’s ok. The animated series follows the adventures of Bean, voiced by Abbi Jacobson, an alcoholic rebellious princess of the fictional kingdom of Dreamland, and her companions Elfo, voiced by Nat Faxon, a very cleverly named Elf, and her personal weed-smoking demon, Luci. Set in a fantasy universe, it’s very episodic, much like Groening’s other works. Most of the story arcs last one episode, two at a push. Some of these include Bean’s father King Zog, voiced by John DiMaggio, trying to marry her off to princes from allied kingdoms to Bean finding a job after being banished from the castle. And honestly, these arcs are very hit and miss. The one episodic story I enjoyed the most was the seventh episode, where Bean tries to find Elfo’s girlfriend after a drug induced hallucination. With that being said, compared to its predecessors, Disenchantment does have an over-arcing main plot, though it doesn’t really set into motion until the last couple of episodes. The ending does stink of a follow-up season (this is only part one) and while the previous episodes only felt like filler, I do want to see what happens to our heroes afterwards, but mainly because there are so many plot elements that have been left with no conclusion. As for the characters themselves, I didn’t really have a lot of time for them, and that’s a problem when that includes the main cast. Bean herself felt very bland, Elfo had a promising introduction to his character which doesn’t really go anywhere, and Luci, well, I really enjoyed his character. Though he suffers the same problem as Elfo with a subplot that doesn’t really go anywhere, his dialogue is handled better than the other characters and is possibly the most comedically reliable with his dry sarcasm and being an enabler to Bean’s shenanigans. As for the secondary characters, they are largely very bland. The only secondary character that I feel gets any real development is King Zog. Throughout the series, he just comes off a stereotypical bad dad mixed with a mad king character, but when the aforementioned main plot decides to make an appearance, we see a different side of the king, and is one of the only side characters to break away from his boring chains with some true development. While this is a positive moment for Zog, the same cannot be said for the rest of the secondary characters. A particular weakness about Disenchantment in comparison to its predecessors is that in the Simpsons and Futurama, the cast were all strong enough to stand alone – just take a look at Apu from the Simpsons or Zapp Brannigan from Futurama. By comparison, Disenchantment’s secondary characters barely have a leg to stand on and fade into the background. It could be argued that The Simpsons and Futurama had seasons upon seasons to develop on the characters, but that’s no excuse. If The Simpsons and Futurama’s secondary characters deserved attention from their creator, then so does Disenchantment. Released on the 17th of August, the series is made up of ten episodes, the longest episode lasting 36 minutes and the running average for the others lasting 28 minutes each. The animation style is traditional Matt Groening, though the colour palette of this show feels a bit more muted compared to his previous work. As well as his art style, some Groening fans will recognize some of the voice actors from his previous works – John DiMaggio also played Bender in Futurama. The soundtrack isn’t anything to really boast about, and the opening is just there. It doesn’t stand out, especially when you compare it to The Simpsons’ iconic intro to each episode. Though it’s advertised as a comedy, much like the episodes of the show, a lot of the jokes and dialogue are hit and miss, going as far as painfully boring at their very worst, though these are mercifully rare. In all honesty, I expected a lot more from Matt Groening’s first stab at an internet streaming series. Futurama was a great cartoon while it lasted, and though it has suffered as of late, The Simpsons was once one of the funniest animated series to hit the small screen. While it may look like Game of Thrones meets The Simpsons, Disenchantment doesn’t have any of the magic of Groening’s previous work, and unless its creator goes back to the drawing board and works on it a bit more, this will be a series that will fall into obscurity. I usually think leaving the story half-done with the promise of a follow up season is a cheap tactic, but in Disenchantment’s case, it may be its saving grace. It’s not an altogether bad show, it’s just one which needs a little more time and energy spent on the development. 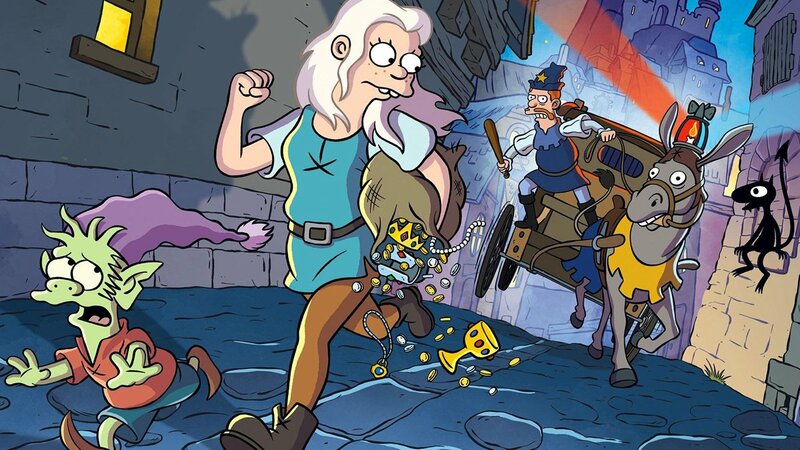 Disenchantment is far from Matt Groening’s best work but has a lot of room for potential and is worth a watch if you are a fan of animation.